There are so many free music series this summer in Boston– you’ll probably come across a few of these without even trying! Free Boston Calling Block Party every Thursday evening from 5-8pm at Dewey Square. Thursday nights from May until August 30, 2018. Free, but 21+. Free Landmarks Orchestra Classical Concert at the Hatch Shell on Wednesday nights from 7-9pm this summer. Wednesday evenings from July 18, 2018 to August 22, 2018. Boston Harbor Hotel’s Summer in the City program offers free music on Tuesday, Wednesday, and Thursday evenings from June 7, 2018 to August 28, 2018 from 6-10pm in the courtyard at Boston Harbor Hotel. Free Harborwalk Sounds at the ICA happens on Thursday nights at 6PM this summer with free music. (Reminder: ICA admission is also free on Thursday nights). Thursday nights from July 5, 2018 to August 30, 2018. Boston Public Library’s Concerts in the Courtyard has free music every Wednesday night at 6pm and Friday afternoon at 12:30pm in the courtyard at the Boston Public Library from June 1, 2018 to August 31, 2018. Concerts are moved to Rabb Hall if weather is a concern. Free Midday Music at Post Office Square with music on Tuesdays and Thursdays from 12-2pm at Norman B. Leventhal Park. June 7, 2018 to end of August. Free concerts at the Charlestown Navy Yard at 6pm on Thursdays from June 28, 2018 to August 2, 2018. Tito Puente Latin Music Series is every Thursday night at 7PM at various parks and playground in Boston neighborhoods. July 5, 2018 to August 9, 2018. Free concerts around the city with ParkARTS Neighborhood Concerts from July 10, 2018 to August 5, 2018. At various neighborhood parks and dates vary. The Dorothy Curran Concert Series has four shows all on City Hall Plaza this summer and is the longest running outdoor concert series in Boston. July 25, August 1, August 15, and August 22, 2018. Free music at the Prudential Center in the courtyard with Summer Tunes from Berklee College of Music every Thursday from 5-7PM. June 14, 2018 to July 26, 2018. Berklee’s Summer in the City series has free live music at lunchtime at Brewer Plaza in Boston Common at noon, quite often. Free Berklee after 5 concert series every Thursday at 5pm at Kendall Center. June 7, 2018 to August 23, 2018. Free Summer Concerts at Kendall Square on Thursdays at lunchtime. Every Thursday at noon from now until August 30, 2018, no concert on July 5, 2018. Free Live Music on Thursdays on the Green at the Street in Chestnut Hill from 5-7PM. Enjoy free music at Waterfront Plaza on Thursdays at 12pm in June and July from Berklee School of Music. 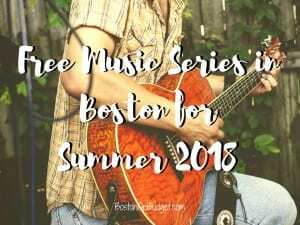 Did I miss any fun and free music series in the Greater Boston area this summer? What is your favorite free music series? I am the planner for the City of Everett VillageFest which is a free concert on 9/15/2018 on Santilli Highway, Everett. I would love to share this event with your readers.